Helmets are a must in most forms of scrambling and climbing, particularly ice and alpine climbing. In recent years, helmets have become more common at sport crags as well. Many people have correctly realized that helmets do not only protect from rock fall, but also from other hazards. Catching a heel, missing a clip or blowing a piece can all result in awkward or big falls where a helmet will surely come in handy. With regards to rockfall, protection from a helmet is unfortunately limited. Most helmets would fail well under impacts from toaster-sized blocks. Secondly, helmets are most stringently tested for top impacts, therefore no good if an object is hitting you at a strange angle. Good decision making (belay placement, right-place/right-time) has a bigger impact on the safety of your day than your choice of helmet. 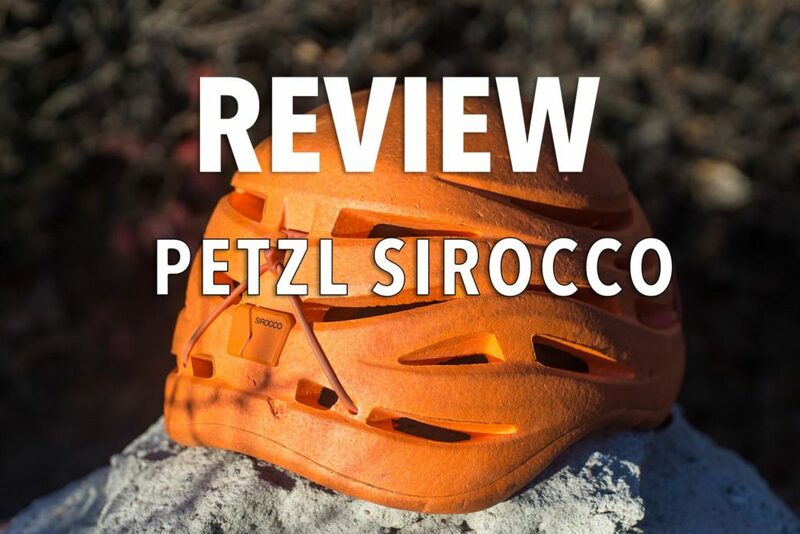 One of the most interesting helmets in recent times has been the Petzl Sirocco. While the colour is offensive initially, the ingenuity of the helmet is remarkable. While being incredibly light, Petzl created a one-piece helmet able to withstand multiple impacts. This has been a huge improvement over previous ultra-light helmets (like Petzl’s own Meteor III+, Black Diamond Vector or Camp Speed). Upon major impact, such helmets would crack thereby saving your head but breaking your helmet. This not only meant buying a new helmet, but also reduced protection for the rest of the day. Interestingly, my last few helmets (all traditional hard shell with foam helmets), had to be retired in rapid succession due to cracked or wobbly foam. This damage was mostly due to being transported in backpacks or duffels. In this regard, the Sirocco has impressed me. For the last 2 years, the helmet has stood up countless days of climbing, summer & winter. During this time, it’s been hit (mainly with ice) and has traveled extensively. This durability is partially due to the material’s slight flex, which absorbs impacts. The only damage it has sustained so far is from catching a branch while bushwacking. At times, its light weight and good ventilation have me checking if I’m still wearing the helmet! Easy one-handed/gloved operation of helmet straps. The author on The Dream, probably the best gear-protected 5.9 in Skaha, Penticton. The helmet adjusts using a simple system of straps and has a good range of adjustment. The helmet comes in two sizes (size two was tested). Testers found it necessary to fully loosen to buckle before putting the helmet on, but found it not to be a big issue. Likely you’ll be wearing the helmet all day. When you’re in for a long day, the headlamp straps were tricky to use while wearing the helmet. Contrary to other designs, the front headlamp clips face downwards, making it harder to install the headlamp. Once mounted, the clips held the headlamp well. The securing mechanism at the back was easy to operate with gloves, and easily accommodated a ski goggle strap for those ski-mountaineering missions. The magnetic buckle works well, though it might be hard to replace if it breaks. The magnet only helps close the buckle, so the actual connection is still through a proper buckle. The helmet is ventilated well, with no further adjustments possible. The removable interior padding is minimal, but suffices. To reduce the overall height of the helmet, I’ve removed the top-of-the-head padding. The helmet remains comfortable. The helmet has been tested by several Mountain Moxie members, during both winter and summer climbing, scrambling and mountaineering. In several cases, members took rock and ice fall to the helmet. In most cases testers were surprised by the soft impact the helmet provided, undoubtedly due to it’s flexible material. For ice climbers, there’s an additional visor available (not tested here), though it is available for an additional 45% cost. Our partners at The Alpine Start gave some more user-insights in their First Impressions. Petzl uses expanded polypropylene (EPP) for the construction of the Sirocco helmet. This memory foam is used in car bumpers and absorbs kinetic energy by deforming. I does so much more efficiently than other helmet materials. All other ultra-light helmets have used expanded polystyrene, which needs a protective cover of polycarbonate to reduce the impact to the foam. The Black Diamond Vapor, Petzl Meteor III and Camp Speed use the later construction. The one-piece Sirocco weights in at 165 gram (size 2), 20% lighter than it’s direct competitor, the Black Diamond Vapor. Despite being lighter, the Sirocco passes both the CE EN and UIAA testing standards, the later being more stringent (they allow 20% less force to pass through to the testing subject). The Black Diamond Vapor only passed the CE EN testing, pointing toward the Sirocco being the stronger helmet. The Sirocco represents a big leap in helmet technology by delivering an uncompromising balance between lightness and durability. The confidence-inspiring flex of the helmet delivers years of regular to heavy usage. If you are in the market for a new helmet that’ll last you a long time, the Sirocco is a worthy contender. Brandon Pullan and the author on top of Gobi65, a new route in the Bow Valley. From Alpine Guide, Brent Peters of Peak Strategem. “I concur with Maarten’s comments. I also make the following observations after using this helmet exclusively since May 2013. I estimate 500+ days of use. 1. The magnetic buckle collects metallic grit. When enough grit is present, it will prevent the closure of the buckle. This is particularly problematic at venues like Skaha Bluffs, Penticton, British Columbia. 2. The male side of the buckle is prone to easily breaking if stepped on or squashed in transit. An easy solution to protect it is to close it even when not in use. 3. The helmet although durable is not completely indestructible. I cannot recommend using it for playing soccer or rugby in the parking lot. That said, this is the most durable helmet I have owned since the Petzl Ecrin Roc, and certainly the most durable and lightweight. Ultra-light gear (specifically personal protective equipment) has a limited lifespan. Both Black Diamond and Petzl recommend retiring helmets that have received a significant impact, even without visible damage. Please refer to your equipment manufacturer’s disclaimer before using any product.